"One room where we visited more than once was The Wes Bender Studio NYC room." Martin Appel said that the whole system at WBSNYC was "on par with the best that we heard and Wes was as cordial a host as one could want." He thought the new Prince E's sounded "superb" with the Viola electronics, Redpoint Turntable and Lindemann CD player. Martin also noted that the Kaplan Cable power cables and power conditioning as well as the Jorma Design interconnects mad a "substantial contribution." "Paul Kaplan, from KAPLAN CABLE, Peter Clark, from REDPOINT and Paul Jason of VIOLA were available to answer any questions you could throw at them." We can only imagine the many questions thrown at them. Perhaps, most telling and the most compelling words in his review, "I spent my last evening closing the room." "Wes Bender Studio NYC assembled a fine-sounding system...The sound here was large-scaled and bold, with deep, tight bass and a smooth, extended top." The Audio Beat's Paul Bolin said in his CES 2012 write-up. While in the room, Paul played his own Coma Divine CD and played Porcupine Tree's live "Radioactive Toy" and found it "exceedingly spacious, well sorted and powerful, as were the Driscoll/Auger track and the classic "St. James’ Infirmary" from the Louis Armstrong Plays King Oliver LP. This system had a physicality and image density that were very habituating." Greg Weaver of Positive Feedback named Wes Bender Studio NYC as one of the ten best sounding rooms at CES 2012. Greg describes his picks as an "accounting of the ten most musical, most life-like, most astounding sounding rooms at this year's event." We are honored and pleased that Greg liked what he heard in Room 30-323 at the Venetian. Greg said that he looks forward to finding Wes at shows because, "Wes always manages to be involved, in some capacity, with great sounding rooms. This year was no exception." Wes Bender Studio NYC debuted the Hansen Prince E loudspeakers and Greg seemed very pleased with this world debut (as well as the other Hansen Emperor E's which debuted in another room). Greg wrote, "While the Prince-E and Emperor-E share the same single tweeter, the Prince-E uses essentially one-half the rest of the driver complement of the Emperor-E... Let me assure you; half the speaker is was NOT." He called out the Viola electronics Cresendo preamp — also making its world debut at Wes Bender Studio NYC, noting that it "delivered sounds that were very smooth and balanced." And that "this system's strengths were voicing, resolve, and coherence. The system was overwhelming with its ability to render tonal color and texture, and at maintaining timbral purity, the exquisite laying of instrumentation, and its overall articulation and focus." Despite being unfamiliar with the Viola name and line, he was "quite impressed with their performance." While visiting the room, Greg spoke with Redpoint Audio Design's Peter Clark. Greg has used a Redpoint Audio Design Model D turntable as his reference "for the past 4 years now...mounted with the Tri-Planar Ultimate Mk VII arm and sporting the Dynavector XV-1t cart. You know, I've heard much pricier table/arm combos, but I've yet to hear one that can readily best this match up. This year was no exception." Greg Weaver and Positive Feedback called out both the Hansen Emperor E and Prince E for "Best Sound" at the show. "I want to tip my hat to Lars Hansen, who just knocked me out with the introduction of, not one, but TWO products at this years CES show, THE PRINCE E and THE EMPEROR E loudspeakers. Introducing any product at one of these shows is hard enough, yet this year, he introduced two-and both of them landed on my short list of the best... That is a feat worth noting..."
Stereo Times' Key Kim at CES 2012: "Wes Bender Set Up a Standout Room"
"Wes Bender set up a standout room." Key Kim of Stereo Times seemed to like the Wes Bender Studio NYC room at CES 2012. He took special notice of the Viola Labs amps driving Hansen's new Prince E loudspeakers. Adding, "Don’t be deceived by the size, like its big brothers, the Forte effortlessly controlled the Prince E with ease. The Prince E sounded beautiful. It was detailed with lots of resolution, transparency and musicality." He included a nice photo of the Redpoint Model D, the white turntable almost looks pink in this shot. John Atkinson stopped by the Venetian Room during CES 2012 to check out the leather-covered Hansen Prince E loudspeakers which were making their world debut in Wes Bender's room. John listened to the QRP pressing of Shelby Lynne singing Dusty Springfield's "Just a Little Loving" on a Redpoint turntable with a Tri-Planar arm and Dynavector XV-1t cartridge. He said that "the bass guitar on the Lynne album positively growled on the Prince Es driven by Viola Forte monoblocks, with terrific power." Stereo Times' Perry Clement, "People, Places & Things" took this nice shot of Paul Kaplan at the Wes Bender Studio NYC room at CES 2012. CES 2012 over at Wes Bender Studio NYC, Hansen's new E Series (Emperor and Prince) made its world debut... and debuted right on over to Robert Harley's Best of Show (cost no object). Ultrahighendreview.com took notice of Hansen, Lindemann, Viola Labs, and Redpoint Audio Design in the Wes Bender Studio NYC Room at CES 2012. 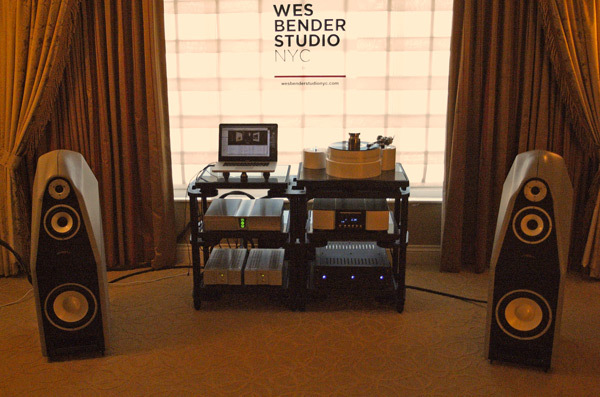 "Wes Bender NYC sponsored a room featuring the US debut of the Hansen Audio The Prince loudspeakers ($39,000/pair) and the world debut of the Viola Audio Crescendo preamplifier with integrated DAC ($19,000), which was handling input from a MacBook Pro. The speakers were powered by the Viola Audio Forte monoblocks ($19,000/pair)." "Vinyl was spinning on a Redpoint Audio Designs Model D ($29,000) with Tri-Planar Ultimate Mk VII tonearm ($5000) and Dynavector XV-1t phono cartridge ($9250). The phone stage was a Wavestream Kinetics Deluxe ($7995) (not shown)." 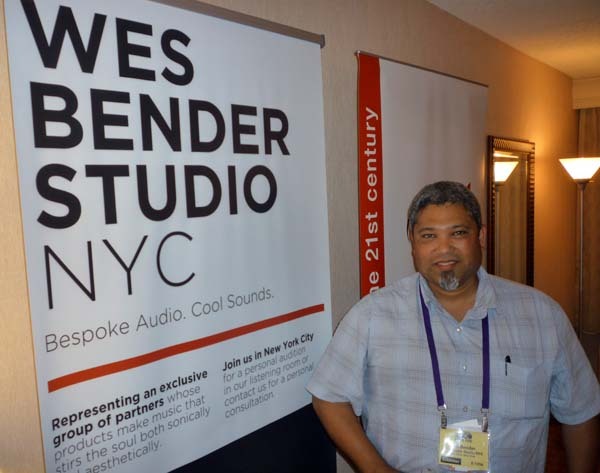 At CES 2012, The Absolute Sound's Jonathan Valin stopped by the Wes Bender Studio NYC room. Apparently, Jonathan liked the Hansen Prince E speakers powered by Viola Labs amps, connected by Kaplan Cable — he named them in his Best Sound of Show post. Neil Gader said that his introduction to the Viola Audio Lab Crescendo preamp coming through Jorma Design cabling and out Hansen Prince E speakers "was nothing less than a bracing experience". At the Rocky Mountain Audio Festival, Wes Bender Studio NYC presented a "visually and sonically impressive system" that packed the listening room. Stereophile's Stephen Mejias noticed and posted a review here. Here's a PDF of the October 19, 2011 captured Tuesday, June 12, 2012. CNET's Audiophiliac at RMAF 2011: "It doesn't get any better than that." At the 2011 Rocky Mountain Audio Festival CNET News Reviewer Steve Guttenberg sat in the Wes Bender Studio NYC room, closed his eyes, and said the sound "oozed refinement and class" and that he "could almost believe the sound wasn't coming from a hi-fi." "It doesn't get any better than that" Guttenberg said. He was particularly impressed with "the way the Wavestreme Kinetic V-8 ampliffiers made the Hansen Audio Knight speakers get up and dance." Or download a PDF captured June 18, 2012. Michael Lavorgna at AudioStream reviewed WBSNYC at RMAF 2011. He thought the system sounded "fast, dynamic, wide and deep with a very nice chesty quality to the vocals". Michael also observed that all of that excellent sound coming out of the Wes Bender Studio NYC room was achieved with "no room treatments". You can read Michael's full post here.